Holidays are the best excuse to pig out. In these salad days, we so often berate ourselves for craving sinful treats that the upcoming Chinese New Year and Valentine’s Day occasions are – to me, at least – just validation for my need for sweets. So just imagine my ecstasy when I found out about the new limited offerings from the ever liked Tiong Bahru Bakery! There are a bunch of dangerous deals that will tempt your tastebuds, empty your pockets, and still have you coming back for more. Almond. For the love of loves, no heart is too big for all you lovebirds. The special edition Nougat and Strawberry Macaron ($8.50) is generous in portion as it is in flavour. The almond nougat cream is a stately balance to the smilingly sweet pastry, and the white chocolate heart with the words “Je t’Aime” just melts my heart. Being in my 20s and single means Chinese New Year ain’tgon be so fun no more. Before you cue the naggy aunties and barely veiled hints of me collecting dust on the shelf, I will arm myself with Pineapple and Coconut Tart ($8.50), a delectable modern spin on the age-old pineapple tarts we popped as children. This is my favourite of the lot, because of the balance of flavours with the light touch of pineapple mousse, and the surprising crunch of the sugar crust base. The coconut cream also plays off the white chocolate disc really well! Pry me off the wall and colour me happy. Your hongbao, I don’t need. Whoever said diamonds are a girl’s best friend obviously never tasted the Chocolate and Hazelnut Kouign Aman ($4.50) before. This is affordable comfort food in generous dollops at its best. Ever a sucker for Ferrero Rocher (so many childhood memories please! ), this spinoff of the KouignAman (another favourite of mine) has so much crunch and dense chocolate. I love. The final limited item in this lineup is the Orange and Chocolate Marble Cake ($4.50/slice and $18/whole cake), a different take on the marble cake that is another staple of my childhood dessert memories. As with all good things, these super items are only available for a limited time. 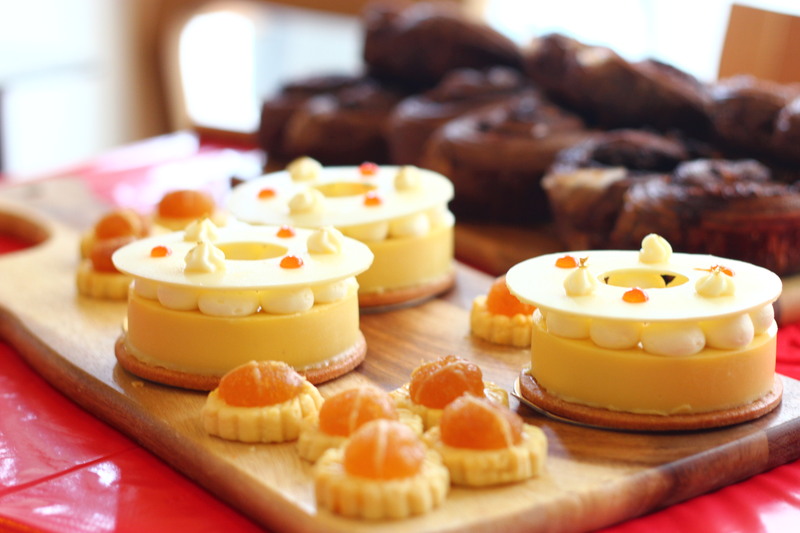 So head to any TiongBahru Bakery soon! The Pineapple and Coconut Tart, Chocolate and Hazelnut KouignAman, and Orange and Chocolate Marble Cake are available from February 2 to 28, 2015, at all Tiong Bahru Bakery outlets. The Valentine’s Day Nougat and Strawberry Macaron is available from February 9 to 15, 2015, at all Tiong Bahru Bakery outlets.